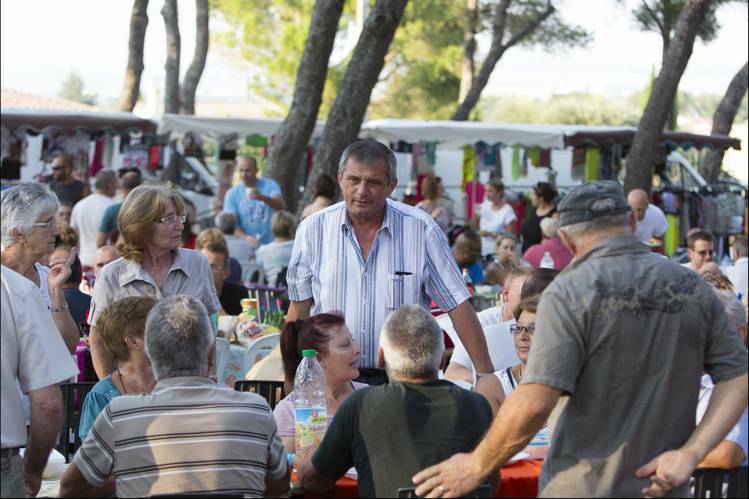 CHÂTEAUNEUF-LES-MARTIGUES, France—The mayor of this sleepy town near the Mediterranean coast gathered a crowd in the community hall on a recent day to discuss complex instruments that most of them had never heard of: financial swaps. Over three hours, he described how a loan pegged to the Swiss franc that municipal officials took out years ago had become so burdensome that the southern French town could no longer afford to build the school it needed. “This toxic loan has considerably impacted the town’s finances,” said Roland Mouren. Like several hundred cities across France, Châteauneuf-les-Martigues took out a variable-interest-rate loan in the mid-2000s to restructure debt and reduce interest payments. The loans offered very low interest rates for the first few years, before the rate would start to vary according to the value of the Swiss franc. Contracts that convey currency risk in this way fall under the category of what are known as financial swaps. At their inception, the loans had appeal to both parties. Borrowers were guaranteed low initial interest payments, and they didn’t expect the rates to rise to anywhere near where they ended up. “At the time, it seemed like an easy way to get money,” said Mr. Mouren, whose predecessor took out the loan pegged to the franc. For the lenders, structuring the products with the currency peg allowed them to charge higher fees. And such products were, at the time, easily passed along to other investors looking for currency protection or exposure. Banks, seeking to boost their profits in a competitive market, pitched the loans to municipalities across Europe, and they became especially popular in France. Municipal bank Dexia controlled almost half of municipal lending market there, and it aggressively marketed the loans to French cities. Now—with the euro having sunk after long enjoying a higher valuation versus the franc—scores of municipalities across France have come to rue the day they accepted the offers. Interest rates on some of those loans started to increase during the financial crisis. That has accelerated in the six months since the Swiss National Bank abandoned a cap on the franc’s value versus the euro, sending the Swiss currency skyrocketing and the euro plummeting. The euro’s value against the Swiss franc was at 1.04 francs per euro Friday, from 1.65 in September 2007. Interest rates on over €5 billion ($5.4 billion) of loans held by French municipalities and tied to the rising franc have reached unprecedented levels, leaving cities struggling with a mounting debt burden. Several hundred municipalities have sent demands for financial aid to the government. The loan mess is turning into a municipal crisis for the French government, which bailed out Dexia’s French unit in 2012 as it struggled amid the crisis. The state remains reluctant to foot the bill. But—since it now effectively controls the bank that is owed money—the government risks losing billions more in court if the municipalities and the bank can’t work out terms for repayment and the lender should lose any related legal judgments. A handful of mayors have filed complaints against Dexia claiming they weren’t informed about the risks involved and seeking to cancel the loans. A spokeswoman for SFIL—the state-owned municipal lender that emerged from the ashes of Dexia’s French business—declined to comment on specific cases. She said SFIL has made settlement offers to all the cities that have filed complaints against the bank. French lawmakers estimated last year the financial jeopardy for Dexia at around €17 billion, a risk that is now weighing on the government. “The tab keeps growing, and no one wants to pick it up,” says Maurice Vincent, a member of the French Senate. Châteauneuf-les-Martigues took out a €6.6 million loan in 2007. The loan carried an interest rate of 3.6% during the first five years. After that, it would increase to 3.95%—or exponentially higher if the Swiss franc exchange rate to the euro slipped below 1.45. Initially, the move allowed the city to significantly bring down the cost of debt and invest in a new media center and gymnasium. 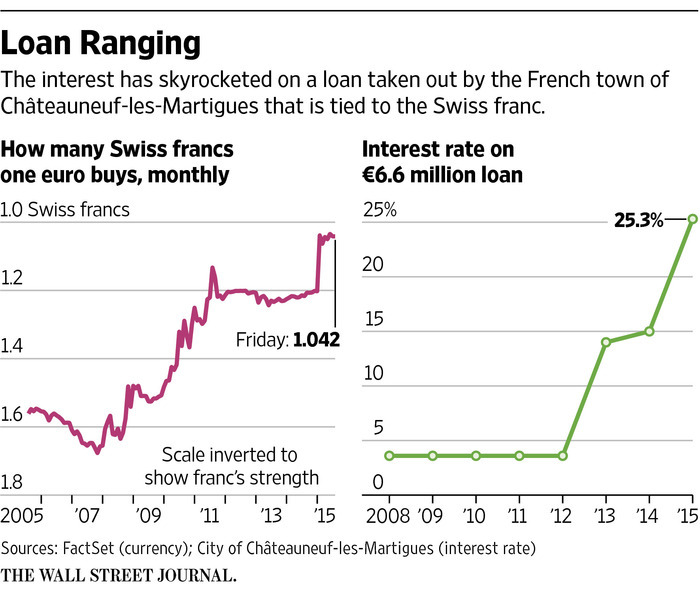 But as the financial crisis broke out, jittery investors started turning en masse to the franc, regarded as a haven. Many cities suddenly saw the interest rates on their loans surge. Unieux, in southeastern France, was one of the first cities to file a complaint against Dexia, in 2011. Several dozen others, including the department of Seine-Saint-Denis on the northern edge of Paris, Angoulême in southwestern France, and Châteauneuf-les-Martigues followed suit. SFIL appealed a July 2014 ruling ordering the bank to pay €3.4 million to Angoulême, said a spokeswoman for the bank. In that ruling, judges said the bank had miscalculated the interest rate on the loan. The bank reached an agreement with Seine-Saint-Denis at the end of last year. There hasn’t been a ruling in the cases of Unieux and Châteauneuf-les-Martigues. This year’s surge in the value of the Swiss currency—it was at 1.20 versus the euro in mid-January, before Switzerland’s central bank scrapped the currency’s cap—sent interest rates on cities’ loans even higher. For 2015, Châteauneuf-les-Martigues will pay 25% interest on its loan. In February, the government said it would allocate up to €3 billion to help local authorities get out of structured loans. “We are doing our best to pacify the situation,” said a spokeswoman for the finance ministry. But cities say the government offer is just a drop in the ocean. 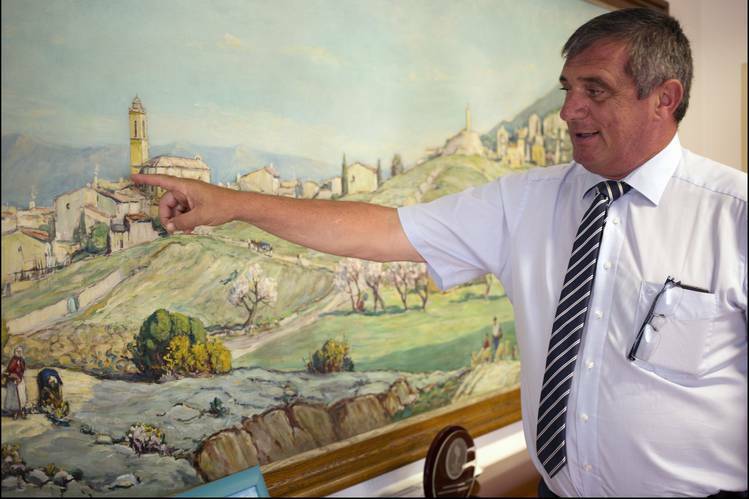 Châteauneuf-les-Martigues says that, even if the government paid 60% of the fees to terminate its loan, as one model the town has investigated posits, the town would still need to pay €13 million in capital, interest and fees to get out of the €6.6 million loan it took out eight years ago. And the government money would come in annual installments over the next 15 years, meaning the city would need to take out a fresh loan to pull off the refinancing. “It’s a joke,” says Mr. Mouren, who has hired lawyers and is preparing for the next hearing in January. “Unless the government gives us more, we’ll keep up the fight,” he says. Posted on July 22, 2015, in Postings. Bookmark the permalink. Leave a comment.